I bought this bottle at my local grocery store (H-E-B), and I knew nothing about this beer before purchasing it. I clearly bought it to add to my collection of unique beers. I was rather surprised at what this beer had to offer after reading about it, and drinking it. All of which is to my liking! Enjoy the read. AMA, a three beer special series released by Italian brewery, Amacord with collaboration with American brewer, Garrett Oliver of Brooklyn Brewing Company. 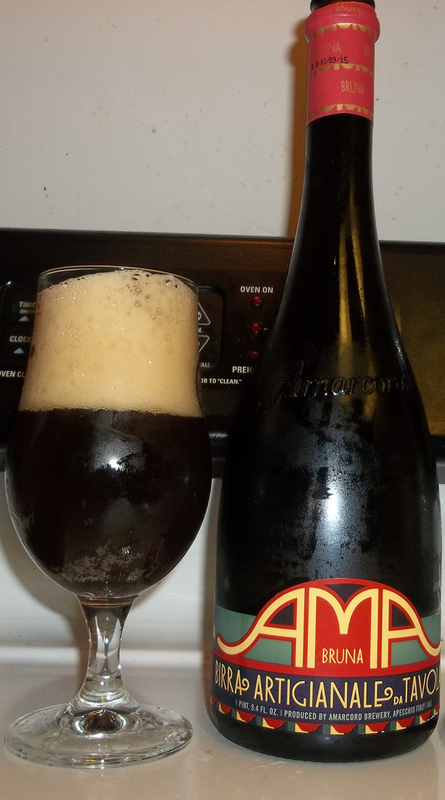 The logo design on this bottle and the other two AMA beers were created by artist, Milton Glaser, who is known for designing the famous “I love NY” logo. Poured into my Boulevard Brewing Smokestack Series tulip glass. This beer poured a hazy dark brown, caramel color with a very thick tan colored foamy head that stayed a while leaving great lacing on the glass. This was a beautiful beer, and I wish I had a better quality camera to show you what I meant, but the picture I took will do just fine, I guess. The mouth feel was a medium body, leaving a bit of a sticky sensation afterwards, I’m sure due to the caramelized sugar. The taste was exactly as expected as well, especially after the great first smell of this beer. The flavor is a bit complex with hints of malts, bread, caramel, yeast, brown sugar. There is a mild bitterness present to tie it all together. Overall I say this is a very fine beer, made to be drank in moderation, and enjoyed with a nice, elegant Italian dinner. I will now be on the hunt for the other two bottles of this series. I am very curious about those.